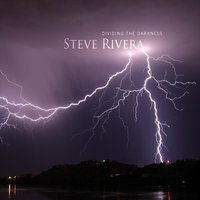 While Dividing The Darkness is not pianist Steve Rivera's literal first recording, it is his first one for public distribution. This makes the excellence of his "debut" even more startling. I admit that after all these years of reviewing, not much surprises me any longer, but I am still pleasantly shocked when an artist just comes out of nowhere and makes music this self-assured, this emotional, and this accomplished, especially without falling into any one of a hundred potential pitfalls. Of course, since Rivera chose to journey to that haven of keyboard artistry, Imaginary Road Studios, and work with the masterful production/engineering duo of Ackerman and Eaton, any chance of falling into one of those pits was almost completely eliminated. However, that still left the heavy lifting of composing and playing to Rivera, and was he ever up to the task. Given the cover image of a brilliant lightning strike in a night sky, I didn't really "get" the music on the album at first. The natural assumption, I would think, would be to expect "stormy" music of a sort—powerful, dramatic, and startling, hence the visual metaphor of the lightning. After "getting to know" the artist better through reading about him, I came to theorize what the album's title means (granted, this is my interpretation). I think that the artist views his music as a part of his "spiritual/emotional" persona and in that regard his music "divides the darkness" of those elements in our world (or perhaps just his). In other words, the music on the album keeps the bad at bay. It serves as a way to push those elements that would destroy or corrupt apart. As I said, this is my interpretation, but I think it is apt, especially when I delve into this music. And that music is well worth delving into—deeply! Nine tracks, ranging from just under four minutes to a little over six minutes in duration, one being a solo piano number and the remainder featuring, oh you know, the usual suspects from I.R.S. (Imaginary Road Studios): Eugene Friesen on cello, Jeff Haynes on percussion, Jill Haley (and Gus Sebring) on English horn, Noah Wilding on vocals, Charlie Bisharat on violin, Tony Levin on bass, Premik Russell Tubbs on EWI, with Eaton chiming in on electric bass, electric guitar, keys, percussion on several tracks and finally Ackerman himself sitting in on one track on guitar. It's no wonder that only Eaton and Haley have released solo albums recently, what with all the session work these folks do for I.R.S. Most of the music on Dividing The Darkness flows with friendly warmth and palpable sincerity and is, more or less, low key in tone and mood (one exception being “Delicate Force” which begins quietly but shifts to become the most dramatic piece on the album). Romantic neo-classical influences pepper the opening track, “My Way Home,” evoking a welcome return to one’s family. No fewer than six artists accompany Rivera on this track and, in fact, most of the songs feature multiple guest players (somewhat unusual based on my knowledge of Imaginary Road releases). The theme of traveling is also present in the second selection’s title, “This Ancient Road,” however here the mood is somber, maybe even overtly melancholy, at the outset, but swings into neutral introspection at times. The accompanists on this song do not enter the piece until midway through and their entrance (most notably Haley’s English horn) adds depth and warmth to the number. “Help Me To Listen” maintains the reflective nature of the previous track, although any trace of melancholy is replaced by a more optimistic feeling. Tubbs’ EWI gracefully flits above Rivera’s piano melody and it really imparts of sensation of caring and warmth. Tempo picks up on “Skyward” but the piece is colored in subtle shadow at times so that the faster pace is counterbalanced by occasional minor key snippets of melody. Friesen’s cello plays an important role in “grounding” the song even as Rivera’s fingers dance sprightly on the keys. Five more tracks are featured on the album (including a solo piano coda to “Skyward), and on each song, Rivera shows a deft touch and an assuredness that is usually heard only on veteran artists’ recordings. If he can exercise such restraint and display mastery of nuance as he does on, for example, the sorrowful “So Quickly Gone” I can’t help but wonder how his fourth or fifth album will sound. One thing is for sure, he is bound to have a lot of fans eagerly awaiting any new music from this rising star on the instrumental piano scene.